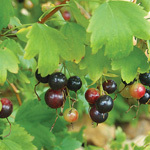 A fast-growing, small to medium sized shrub that does best in light shade & organic soil, though it grows easily in a wide range of conditions. The white flowers appear on new growth, so wild hydrangea can occasionally be pruned nearly to the ground in late fall or early spring. This will encourage vigorous new stem growth and a nice form later on. This is a favorite plant for pollinators. Bumble bees race across the flat flower clusters collecting pollen. It is also a larval host plant for the hydrangea sphinx (Darapsa versicolor) and the hydrangea leaf-tier moth (Olethreutes ferriferana). In cultivation since the 1700's, there are several hydrangea cultivars that produce large, sterile flowers. Our plants are grown from the tiny seeds we collect from populations in Missouri. 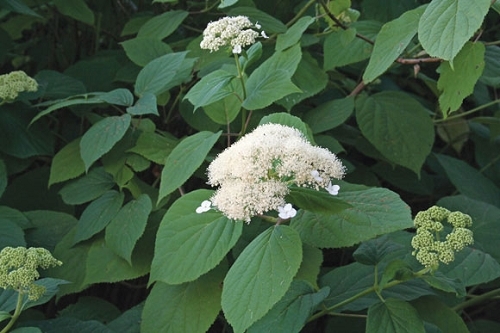 Wild hydrangea can sometimes spread by short, underground rhizomes.